The sun, moon and stars are aligned in this mosaic! 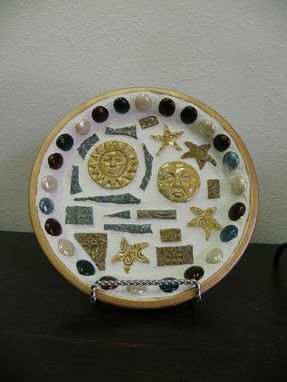 Pieces of pottery by Diane Soileau of Mud Pie Pottery were arranged in a terracotta saucer rimmed with glass nuggets. Outer rim is painted gold. Recommended for indoor use. 10" in diameter.